Yes, that is Peggy Olson in the picture at the top of this article. Not Don Draper. 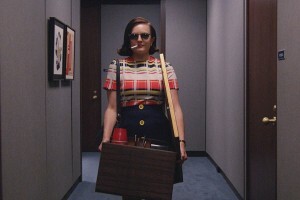 Because this week was all about Peggy. Yes, Don’s story ran throughout this episode, but while he continued to struggle with the same things he has been struggling with in this last half of the last season, Peggy continues growing and has the best scene in the show this week. The very last scene was excellent as well, but we’ll get there in a minute. 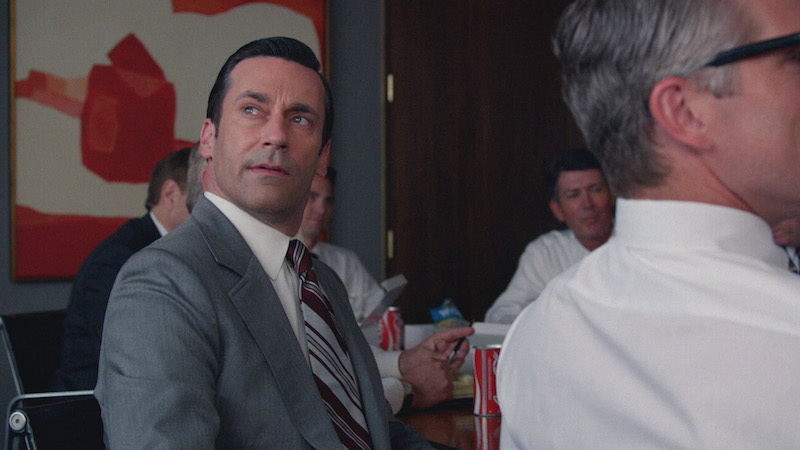 We start this episode with a Don Draper who is literally and figuratively lost. 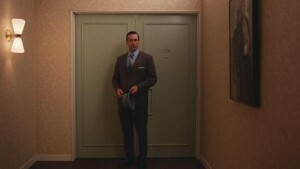 Meredith meets him in the hallway and escorts him to his office to keep him from getting lost “again”. She talks to him about his apartment, the movers, advises him that Mr. Hobart is in so “no napping”, and returns an envelope of his personal belongings that she removed from his apartment for him because she didn’t feel they should be left there with the movers around. Among those belongings is a ring that belonged to Anna. Throughout this episode, we see more signs of Don losing the feeling of being special, important, and talented. Jim Hobart tells him in a private conversation that they want him to bring the place up a notch. A couple of scenes later we learn that he has told Ted Chaough the same thing. 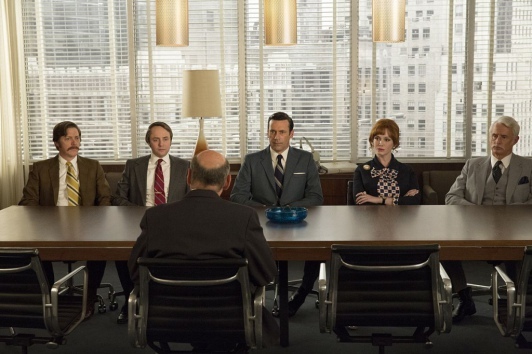 Don sits in a meeting in that same room and observes all of the creative directors behaving in the same way and listening to the new client with pens poised to write down anything he says that gives them inspiration for a campaign. But not one man (all white men) writes down one thing, because there is no inspiration. Don is one of many now, and advertising isn’t emotional and insightful in this new world he has been forced into. He finds it empty and uninspiring. So much so that he watches out the window in this scene and sees a plane flying near the top of the Empire State Building. He grabs his box lunch and leaves the meeting and the building. He doesn’t return. He goes to find Diana in Racine. He finds the home she used to share with her husband, but that he now shares with his new wife. Don tries to determine her whereabouts using a couple of false identities (he’s become good at assuming false identities) but Diana’s ex sees through his ruse and tells him he isn’t the first to come looking for her and that although “she looks so lost,” in Don’s words, Don and nobody but Jesus can save her. Or him. He goes to pick up Sally and give her a ride to college but learns that she got a ride with a friend, the boys are out doing something, and Betty is settling into her life as a college student. Their lives are going on quite well without him. And poor Joan. She feels good about the move when a couple of women at McCann-Erickson come to her office to welcome her and invite her to a girl’s night, but that is the only good experience she has. She has a call with Avon with Dennis, the man who openly made one sexual comment after another during a meeting with her in a prior episode. He is every bit as charming in this scene. When she reprimands him for making an offensive comment to Avon, one he would not have made if he had bothered to read the briefs she stayed up late preparing, he snaps back at her telling her she has no right to get mad. Then Ferguson comes to her office with the appearance of smoothing things over after the problem with Dennis. But he makes it clear women have a place at McCann, and it’s inferior to men. Of course, he’ll help her keep her position and gain the respect of others at McCann-Erickson if she will sleep with him. And the bad situation gets worse when she goes to Jim Hobart and tells him her clients “aren’t getting the attention they deserve” and that she can’t work with Ferguson. She tells him she had some status and independence at SC&P and wants it there. She is told she’ll have to get used to how they do things at McCann, that he doesn’t care about her SC&P partnership, and that her little stake doesn’t matter to Jim. She pushes with threats of leaving with her $5 million or suing for violation of the Equal Opportunity Act. But Jim doesn’t budge and tells her he’ll give her half of her $5 million if he never has to see her again. She considers fighting him but in a scene that left both me and Joan teary-eyed, Roger advises her to take the money and run, and she does, after taking the two things from her desk that are really hers, a picture of her son and her Rolodex. The two of them end up finishing off that bottle of vermouth together. 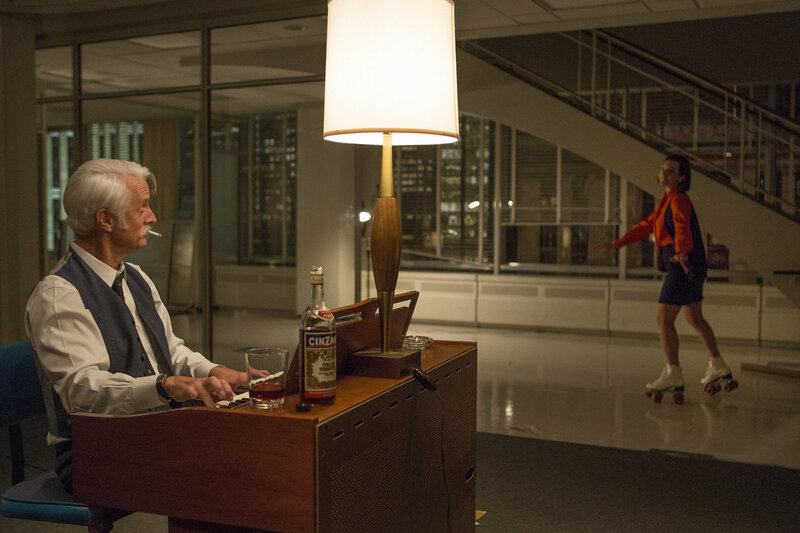 The last shot of them together is classic Mad Men – Roger is playing the organ while Peggy roller skates around the empty SC&P offices. They glance at each other once and smile, and she leans forward and raises a leg behind her. Roger asked her earlier in the episode, looking over his glasses at her, “You think you’re gonna have fun like this over there?” No, she won’t. In fact, she’ll probably have a very difficult time “over there”. But this was fun to watch. 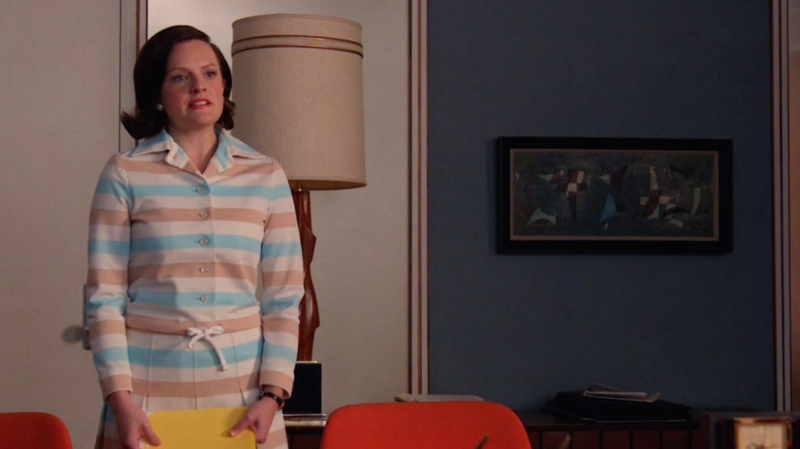 My absolute favorite scene is when Peggy goes to McCann-Erickson for the first time. She’s hung over so she’s wearing dark sunglasses. She has a cigarette in her mouth, her box of things for her office in her hands, and Cooper’s picture of the octopus pleasuring a lady under her arm, with the picture facing out so the whole world can see. She’s strutting down the hallway like she owns that world. (See picture at the top of this article.) She looks at one guy who looks back and then down at the picture. He watches her walk down the hall. She looks directly at two other men who move out of her way without ever looking at her. I loved the end of Lost Horizon. Don is driving down a road in the middle of nowhere and picks up a hitchhiker who’s headed for St. Paul. Wait a minute. He was in Racine, WI and now he’s going to St. Paul? But isn’t New York in the other direction? Yep. I don’t think he has any intention of going back. I think he’s headed for California but has no idea what he’s going to do once he gets there. California is where Anna, the one person who knew his whole story and always loved him, lived. It calls to him. Then cue the music as he drives away from the camera down that long road, headed for St. Paul. You’ve really made the grade. And the papers want to know whose shirts you wear. Now it’s time to leave the capsule if you dare. Indeed they do for Don Draper. 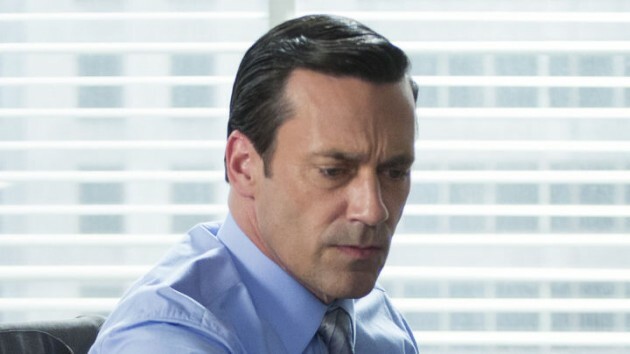 This week in Mad Men we saw Don Draper’s losses continue and his power and position continue their downward spiral. Sterling, Cooper, & Partners either hit the jackpot or lost everything, depending on how you look at it. We were also given some nice scenes involving some special relationships on the show. 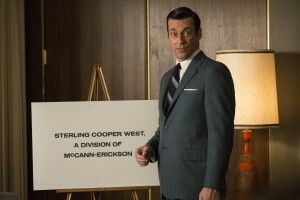 The biggest news in this episode is that McCann-Erickson is “absorbing” Sterling Cooper. They’re being bought out by the firm from whom they have struggled throughout the series to remain independent. They have always wanted to make it on their own, without having the clout that comes with a name like McCann-Erickson, but that isn’t going to happen. “You have died and gone to advertising heaven,” says Jim Hobart of McCann-Erickson and proceeds to parade in front of them some big names who are their clients. The are accounts Sterling Cooper & Partners dreamed of. It’s sure to mean more money for all of the partners but is it a victory? It doesn’t feel that way. It feels like defeat. “Is that all there is?” seems to be the question pervading this season. They have all just gotten what they wanted in some ways, but it’s empty. 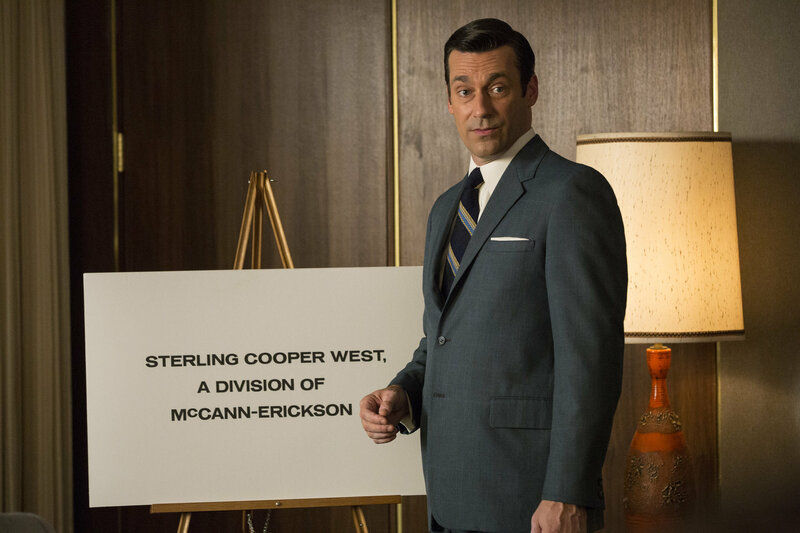 Among the events contributing to Don’s downward spiral is his failed attempt to prevent the loss of Sterling Cooper & Partners. Once before, they were literally hours from being bought, and Don Draper came up with a plan that saved the day. He tried again this time but failed. His charisma has faded and his charm, if not completely gone yet, is dying more every week. If that isn’t enough, he goes out drinking with the other partners after his failed attempt to save the firm, and every one of them has to leave because they have someone to go home to or to meet up with. To make this even more depressing for lady’s man Don Draper, the woman Roger Sterling is meeting is Marie Calvet, his ex-wife Megan’s mother. It’s a drunk, disheveled Don Draper with we see in this scene. Marie literally took everything from Don when, in her daughter’s absence, she told the moving men to empty the apartment of all furnishings. She is the reason he came home to an empty apartment. Ted Chaough is a contrast to Don. Ted Chaough has met someone. He and Don talk about the fact that they both have ex-wives in California. Ted tells him he knows Don is attached to California, and he is, but I don’t think it has anything to do with Megan. I think it’s a sentimental tie and is all about Anna, the one person who knew his story and truly cared about him. Ted says he can’t leave New York because of his new love. Don has nothing to keep him there. Ted comments in the bar that he is glad to let someone else do the driving. Doing the driving is exactly what Don misses. He’s lost control. He doesn’t like it. But it hasn’t fully hit him yet. We haven’t seen a real, raw reaction from him yet. Will we? I hope so. Joan is uniquely impacted by the buyout. In the meeting with Hobart in which he rattles off all the big names everyone will have access to as part of McCann-Erickson, he looks at each one of them and names an account he knows each of them has dreamed of having. Everyone except Joan, a detail that does not go unnoticed by her. 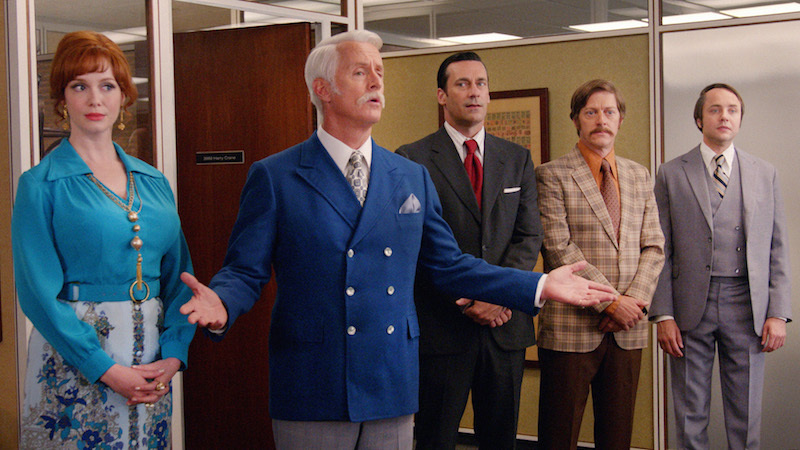 She fears they won’t appreciate her talents at McCann-Erickson, and she’s probably right. 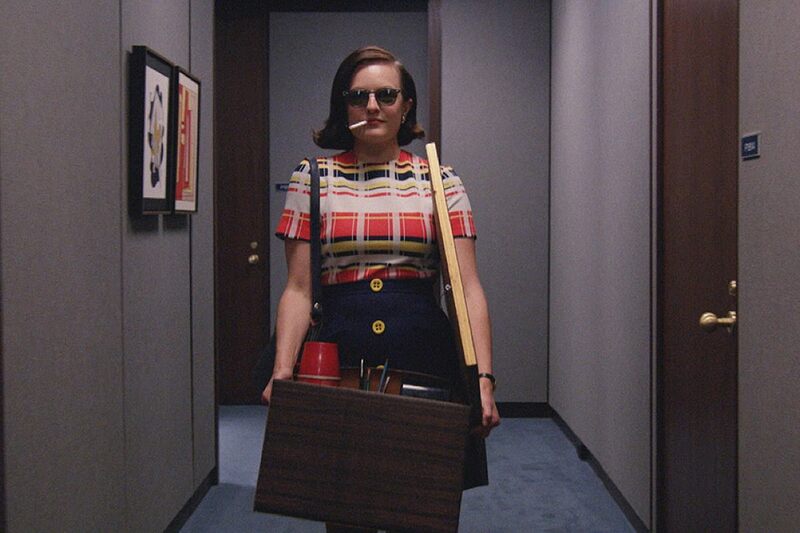 She fought hard and made personal sacrifices to earn her current status at Sterling Cooper, but she knows she still lives in a world in which women are not taken seriously. During a taxi ride with Pete, she comments that “we both know they aren’t going to take me seriously over there,” and she’s probably right. Just a couple of episodes ago she met with a client who made one sexual comment after another and found it humorous despite Joan’s agitation. But she has met a man who does take her seriously – Richard. During a phone conversation, she tells him she has had bad news at work and begins crying. He tells her he’ll be on the next plane to New York so she can tell him all about it. Will she decide to leave McCann-Erickson and begin a new life with Richard? Leave a place she knows she won’t be respected for a place she believes she will be? Maybe. But, as she said in the episode in which she met Richard, she needs to work. Not for the money, she probably has more of that now than she needs. No, she just needs to work. It’s important to her. It makes her feel valuable. We also saw some nice moments with Peggy this week. There was a nice moment with her and Pete on the couch in his office, a spot where many important things have happened between them. One of those things was a conversation in Season Two in which Peggy told Pete about their child she gave up for adoption. In reference to that fact, it is the sight of a child hugging her legs that prompts him to call her into his office and give her a heads up about the buyout. It’s a nice moment between them. His desire to give her advance unofficial notice about something that will have a significant impact on her followed by her giving him a literal pat on the back and gentle reassurance that he will succeed in the new organization. 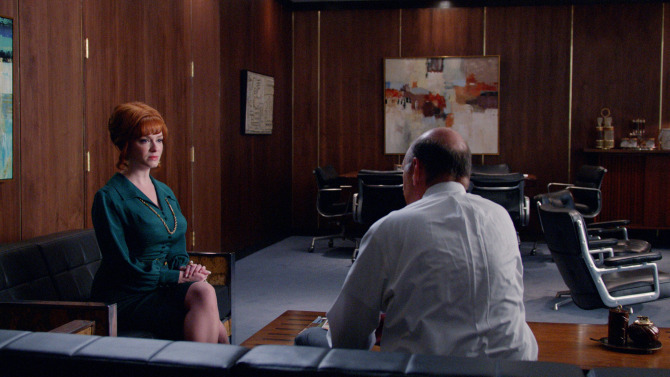 Peggy also had a very important conversation with Stan this week. 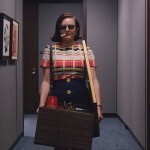 A girl who auditioned at Sterling Cooper for a commercial waits in Peggy’s office for her mother to return to pick her up. When she does, Peggy and the mother argue. In the course of that argument, the girl’s mother tells Peggy, “You do what you want with your children. I’ll do what I want with mine.” Ouch. 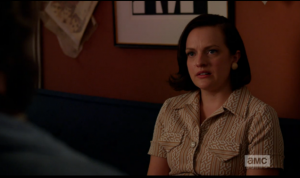 The pain shows on Peggy’s face. “Look, you got to a certain point in your life and it didn’t happen. I understand you’re angry about it, but you’ve got a lot of other things,” he says to Peggy later when she tells him she can’t quit thinking about the argument. “I mean it. You couldn’t have done all you’ve done otherwise,” he says. “Well, not that I know of,” he says, and chuckles. In the final scene, the partners make their announcement. As soon as Roger tells them about the buyout, everyone starts talking over him and walk away. Don tries to save it with, “This is the beginning of something. Not the end.” His statement isn’t even heard. The magic is gone. The glory days are over. What comes next? This episode is titled The Forecast and is about Don Draper trying to find direction. In this last half of the final season he has embraced his vices and demons, then ended a past relationship and experienced a breakup with a woman very much like himself who he hoped to take with him on his efforts at leaving behind pain and guilt and getting on with life.This week he wonders what he is moving toward. He wants to put the past behind him and move on but wonders how to move on and to what? The Forecast begins with Don’s realtor waking him. He’s asleep in bed, apparently naked, but alone. The realtor has potential buyers on the way and wants him up and out. Before he leaves she tells him she’s having trouble selling the apartment because it’s lonely. When he returns later she is angry because she didn’t have any luck with the showing because of the lonely feeling of the place. 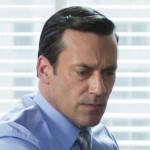 Don (Jon Hamm) tells her not to blame him for her failure. (He will make this same statement to someone else later in the episode.) She tells him it reeks of failure. She says it looks like someone sad lives there, someone who got a divorce and spilled wine on the carpet but doesn’t care enough even about himself to clean it up. When he tells her a lot of good things happened in that apartment, she says, “Well you can’t tell,” much like you can’t tell by Don’s current state of mind that lots of good things have happened in his life. This episode makes progress with the lives of several characters. 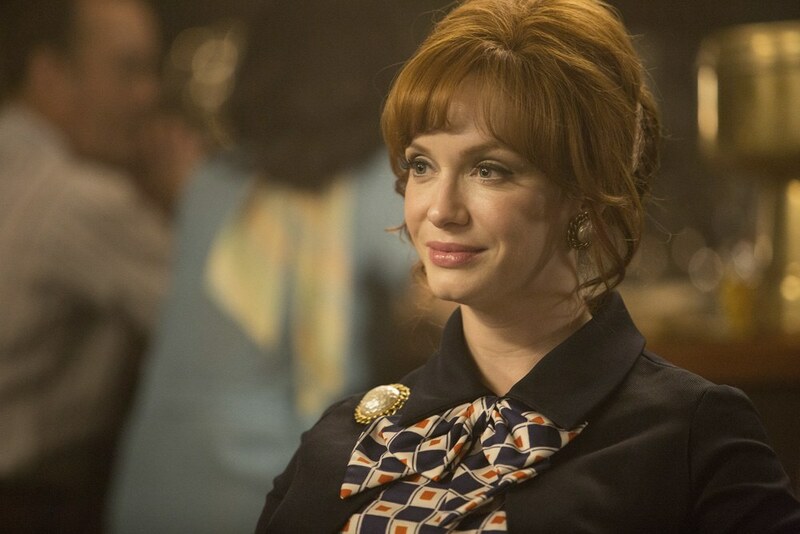 The next scene deals with one of them – Joan (Christina Hendricks). She is also awakened but by a phone call to her hotel room. It’s her mom, who is watching her son. Joan talks to her son until he accidentally hangs up. Irritated, she makes a humorous call to room service for some breakfast. “I’d like some skim milk, grapefruit, and a pot of coffee, please.” Pause. Wait for it. “And some French toast,” she adds quickly. What a great character Joan is. So relatable. When she goes into the office later, she introduces herself to a man she assumes is there for an interview. He isn’t, but plays along until Lou appears with the real interviewee. She ends up going out with the first man, Richard (Bruce Greenwood). He is divorced and retired and has one plan – no plans. He wants to travel the world and can afford to because he’s millionaire developer. His children are grown and he has nothing to keep him in one place. Joan on the other hand has a four-year-old son who limits her mobility and often leaves her conflicted – another part of her character that so many women can relate to. (In one scene of this week’s show she looks at the babysitter and Kevin in her arms and yells, “You’re ruining my life,” and we wonder which of them she meant that for. She begins to storm out but stops short, with a regretful look on her face, when Kevin calls “bye-bye, Mommy,” and she responds “bye-bye, sweetie.”) Richard tells Joan he can’t deal with small children again, that part of his life is over he tells her. But by the end of the show he is apologizing and saying he is buying some property in New York and wants to spend time with her, her son, and her mother. “We’ll see,” she says and tells him he can call her. Bottom line, Joan isn’t going to let someone else call the shots for her life. Throughout this episode, Don is working on a speech Roger has to give at an upcoming business retreat. It’s supposed to tell what the agency is going to look like in a year. It’s supposed to provide a forecast. In a conversation with Ted, he tells him there seems to be less to do and more to think about. Ted figures out that Don is trying to get material for Roger’s speech out of him. “He asked me first,” he tells Don. 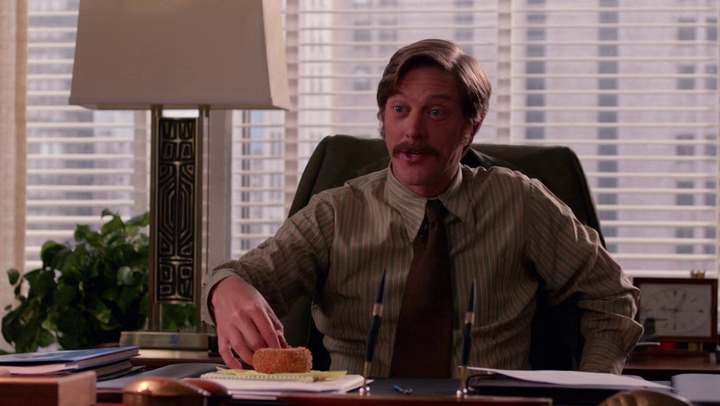 He says he considered doing it, but that he thought it would be better for Don to do it because he’s “so much better at painting a picture.” When Ted (Kevin Rahm) tells him of bigger accounts he hopes to have in the next year, Don finds those dreams lacking. “You know, before McCann all I thought of was would we be in business next year?” Ted responds with, “Or would I be here at all?” which could be said of Don as well. Ted continues with, “Now it could be anything,” to which Don sighs and shrugs his shoulders. “Anything” is vague and empty. He has no idea what his “anything” is going to look like or even what he wants it to look like. The Glen/Sally/Betty triangle comes to its probable close this week. He comes ostensibly to see Sally (Kiernan Shipka), but he and Betty (January Jones) are clearly attracted to each other. There is a shot with Sally standing between them, her eyes moving from one to the other as they converse, a grimace on her face as she watches them “ooze”, a word she will use to describe this encounter and one involving her father later in the show. Glen is now a handsome 18-year old, and he announces that he is leaving for the Army in a week. Sally blows up at him and storms off. She regrets it later and we wonder if Glen may not return from the war, leaving Sally feeling guilty about their last conversation. Betty says he is brave. This relationship has been odd from the beginning. She literally is old enough to be his mother, but she has been desperate for attention in the past and was drawn to Glen’s need for her attention and approval, even when he was just eight years old. Here’s the last scene with Betty and Glen. Not because she doesn’t have feelings for him or because of the massive age difference, but because she’s married. One last interesting thing about ghe scene above, the real reason he joined the Army, to avoid his stepdad’s wrath and gain his pride. Don joined the Army to escape his family. An interesting parallel. Part of why Betty feels drawn to him still and responds to his pass the way she does? Maybe. There are a couple more scenes about Don searching for direction. “It’s supposed to get better,” he states at one point. When Peggy (Elisabeth Moss) tells him she wants to “create something of lasting value.” Don chuckles and says, “In advertising?” “This is supposed to be about my job, not the meaning of life,” she says. Don responds with, “So you think those things are unrelated?” They are completed related in his mind. They are the same thing. Or they have been. And that hasn’t worked out so well for him. Then there’s Mathis (Trevor Einhorn), who storms into Don’s office to lay blame for the loss of a client (Peter Pan, the boy who doesn’t want to grown up, not coincidentally) at his feet because Mathis copied one of Don’s past techniques for dealing with an upset client and failed miserably. When he says the client was lost because of Don’s advice, Don repeats the statement he made to his realtor earlier, “Don’t blame your failure on me.” Mathis makes some comments about Lee Garner having sexual fantasies about him. Don tells him he has a foul mouth and that they lost the client because Mathis has no character, to which Mathis responds, “You don’t have any character either. Quit fooling yourself. You’re just handsome!” Don fires Mathis but appears to have taken Mathis’s comment to heart, because later in the episode he tells his daughter Sally that she is just like him and her mom, whether she wants to accept it right now or not. He tells her she is very beautiful and that it’s up to her to be more. In our last scene, Don returns home to find realtor with some buyers as they are signing papers. It’s a couple. The husband is a stockbroker. They have a 4-year-old and a baby on the way. The realtor walks him outside the door while the couple signs the papers. She is thrilled about the sale. “Now we have to find a place for you,” she says and goes back in the apartment. She closes the door behind her. He turns, and considers going back in the apartment to meet the buyers, a family with a future. He doesn’t though. Instead he turns with his back to the door and just stares at the floor. He has to find a place for himself, literally and figuratively, and he has no idea in what direction that place lies. The closing music this week is the first verse of “The First Time Ever I Saw Your Face”. Appropriate. It’s how life used to be for Don Draper, how he was seen in his prime.